Pop superstar Michael Jackson has attacked a proposed bill in the US which would jail people who exchange pirated music online. Two Democrats, John Conyers and Howard Berman, have proposed legislation which would make file swapping of pirated music and software a crime. The Authors, Consumer and Computer Owners Protection and Security Act of 2003 - known as the Accops Act - carries penalties of up to five years in prison and a $250,000 fine for uploading a copyrighted file to a peer-to-peer (P2P) network. 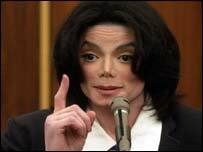 "I am speechless about the idea of putting music fans in jail for downloading music," Jackson said in a statement. "It is wrong to illegally download, but the answer cannot be jail," he added. The record industry, backed by the US government, is stepping up its fight against those who pirate music online. The Recording Industry Association of America is suing users who pirate music online, threatening them with heavy fines. The crackdown comes as a new legitimate online music site launches in the US on Tuesday, offering what it says is the cheapest per-song rates yet. The legitimate online music market is beginning to grow with a number of services offering music downloads. But users are still often limited by the size of the music catalogue available and restriction on the use of the songs once they have been downloaded. BuyMusic.com will offer a catalogue of more than 300,000 songs from the big five major record labels at a cost of 70 cents per song or a full album for $7.95. But the service comes with restrictions and not all songs can be copied freely on to CDs, other computers or portable devices such as MP3 players. Apple launched a similar service for users of its computers in the US two months ago and has sold more than five million songs in that time. 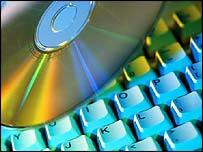 The computer firm charges 99 cents per song but users have more freedom over what they can do with their downloaded songs. The differences between Apple's iTunes service and BuyMusic.com are symptomatic of the online music situation. Record labels are still grappling with the internet as a legitimate means of distribution and have not defined uniform licensing rights for all songs and artists. BuyMusic founder Scott Blum called Apple's chief executive Steve Jobs a "visionary". "But he's on the wrong platform," he added. Apple users make up about 3% of the computer market, while BuyMusic is targeting the 97% of people with PCs. The music industry is trying to compete with file sharing services such as Kazaa and which allow users to download pirated copies of songs.